GO GREEN – St. Patrick’s Day and Beyond! There are so many benefits of eating green (and I don’t mean packaged foods with coloring added!) and so many options of naturally green foods. Set a goal of consuming at least 2 green servings a day for a simple nutrient boost. They tend to be lower in calories, sugar, fat, cholesterol, and sodium; while being a valuable source of vitamins, minerals, and antioxidants. Start your day the tropical way! 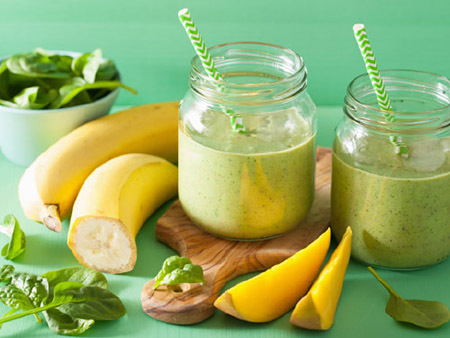 The naturally sweet island flavors will fool your taste buds – they’ll never know this smoothie is full of potassium, iron, magnesium, vitamins and fiber. Save time and reduce waste by using frozen fruits. 1.Add 1 cup of tightly packed spinach to a blender with water. Blend together until all chunks are gone – it should resemble green water. 2.Add fruits to the blender. Blend all together until smooth and creamy. Depending on your blender, this could take up to 2 minutes. 3.Pour into a glass and serve immediately.